This entry was posted in Health and Medicine, SciBlogs, science, Science and Society and tagged Cochrane Fluoridation review, fluoridation, fluoride, misrepresentation, SciBlogs, Stan Litras. Bookmark the permalink. Thank you, Ken. I saw Listra’s “press release” and was irritated that there was, predictably, no opportunity to comment on his gross misrepresentation of this review. If I were he, I would not have wanted any comments either. Undoubtedly, as we speak, Connett is doing the same on an ABC TV news show. It’s a joke – Connett’s crowd are now listing the Cochrane Review as the 3rd thing on their list which is making it a bad year for those taking a scientific approach to the fluoridation issue. Third after the papers on hypothyroidism and ADHD. It is pathetic, Ken. Thanks for your constant exposure of the fallacies of these frauds. There are many in the US who are aware of and truly appreciate your efforts. What is pathetic is the failure of you gentlemen of knowledge and education to recognise the thrust of the review is the lack of evidence it reveals. I have been trying to get research based evidence from proponents of fluoridation and all I get is name-calling and vitriol along with references to reviews such as the York one which covers material mainly produced during the 1940s and 50s. The brutal truth is that until the research being called for by virtually every review conducted over the past 30 years has not been done and reliance on evidence that even many in the medical and dental fraternity are increasingly calling into question is ridiculous and probably dangerous. I know from personal experience that since I stopped ingesting fluoridated water about two and a half years ago my health has markedly improved and my oral health has not been an issue. Why then should I promote adding HFA to drinking water? Trev, your anecdotal story would not pass the strict criteria required for the Cochrane review – so I hope you understand why it wan’t considered. However, with the studies that did pass that criteria there was clear evidence of the efficacy of CWF. That research was definitely done – even if you and your mate Stan are too blind, or too biased, to see it. The misrepresentation and lies employed by Stan are just pathetic. The review did not include cross-sectional studies – which is a pity as most recent studies will have fallen into that category given the length of time fluoridation has existed. However, the review did include a discussion on the nature of this sort of research and why the quality consistently gets rated low. But in the real world we have to work with what is possible – we cannot treat people like rats which would be required for the double blind randomised trials you guys pretend to ask for. In addition to the points about fluorosis so clearly made above, it is important to remember that these mild forms of enamel fluorosis are positively beneficial. The caries protection of fluorosis in a 1st molar is equal to placing and maintaining 1-3 sealants – see Iida and Kumar (2009). Further, enamel fluorosis has no negative impact on the quality of life while cavities have a huge negative effect. . . see Do (2007), Onoriobe et al (2014) and Chankanka et al (2010). Trevor, antifluoridationists are constantly calling for trials on optimal level fluoride to determine its safety, having no idea as to what it is they want tested for safety, because they, like you, have no comprehension of the science of fluoridation. In all likelihood, the vast majority of them have no idea as to what even is a randomized controlled trial. They, like you, simply call for this because they have lazily gleaned the term from antifluoridationist websites, without bothering to take the time and effort required to learn basic facts about fluoridation, what constitutes a RCT, or if such trials are even possible for fluoridation. Cochrane did not address safety to any real extent, simply effectiveness, and I strongly suspect this review had a significant amount of bias itself, against fluoridation, given the number of times it continued to unnecessarily mention “bias”, after it had already made that point. Nertheless, even with this apparent bias, this review still affirmed the effectiveness of fluoridation in the prevention of dental decay in children, and simply reported that there was insufficient data meeting its criteria for inclusion in its considerations, in order for it to assess effectiveness in adults or in regard to social inequalities. Until you learn at least the basic facts of fluoridation your personal call for “researched based evidence” is meaningless, and would be never-ending, regardless of how much valid evidence was presented to you. In regard to “name-calling”, I suspect you are erroneously claiming valid criticism of your arguments to be personal attacks on you. Cherry-picking – or its synonymous variations – is practiced on both sides of the fluoridation debate. Though I fail to see why bias would enter into any study merely because it was conducted before the use of fluoride toothpaste was widespread. I would have thought that a more accurate assessment of water fluoridation could be made if fluoride was not so widespread from another source. Thanks, Blossom, for bringing up this issue of “risk of bias” and research quality as it is a straw that many anti-fluoride propagandists will clutch at. Firstly you need to understand the limitation impose by the criteria used in this review. Blossom, your statement, “I would have thought that a more accurate assessment of water fluoridation could be made if fluoride was not so widespread from another source.” hits on exactly the reason why the early studies on effectiveness of fluoridation were probably the most accurate. At the beginning, the halo effect, and other confounding factors were not significant yet, so accurate segregation of fluoridated versus non-fluoridated populations for purpose of study, was far easier to attain than it is now. The early findings of 40-60% decay reduction in fluoridation are,in all likelihood, the most accurate assessment we will ever attain. But Steve, if only those who do the oral health studies and those who promote fluoridation would also publicly (and in Abstracts) express the differences (fluoridation vs nonfluoridation) in absolute terms (mean average dmfs / DMFS / dmft / DMFT) instead of percentages, then people – including decision makers – who have no access to the actual studies could see for themselves how they are being hoodwinked. i.e. 45-60% could represent in absolute terms no more than one tooth surface or less than one-quarter or one-half of one tooth. Brunelle & Carlos (1990 I think) expressed the difference (c 39,000 children representing more than 43 million children) as 18%. The absolute overall mean average difference was 0.6 of one tooth surface. Had delay in tooth eruption from fluoride exposure been taken into account then there might have been a negative result for water fluoridation. Queensland’s premier claimed about a 60-65% difference (Townsville vs Brisbane). She cherry-picked just one age group. Had she chosen another specific age group the absolute difference was greater but she chose the one she did because the percentage difference was greater. No doubt an advisor of hers chose the figure for her. Steven, when you take into account that more than 97% of the studies used by Cochrane, 2015 were a high risk of bias, that shows even the results of those included studies from when fluoride toothpaste was not so widespread are not to be relied upon. If that is the case, why should others believe the so-called benefits of fluoridation that were reported; but not the adverse effects (dental fluorosis 12% of ascetic concern; and c 40% DF overall)? To ignore the fact that c 40% in the study had some form of dental fluorosis (evidence of chronic fluoride toxicity) is reprehensible. KEN WROTE: “Completely wrong again. If reliable data was not available ‘for further analysis (related to social inequalities from fluoridation), how come fluoridation is promoted as reducing social inequalities? Surely, Cochrane, 2015 would have included ‘suitable’ studies for analysis of social inequalities if any had been published. After all, Cochrane, 2015 was supposed to be getting at the truth of the matter so it could reliably inform Australia’s National Health & Medical Research Council which has another fluoridation review underway. Blossom, I have already mentioned the fact that the Cochrane review did not include cross-sectional studies. Their strict exclusion policy is the reason they did not have studies to draw a conclusion. However, there are studies out there and conclusions are commonly drawn – the review even mentions them in their discussion. The fact is the strict restriction on choice of studies included limits the usefulness of this review to policy makers. I am sure the Australian reviewers will not be so restrictive. 1. I am constantly amazed by antifluoridationists who continue to attempt to make barely detectable mild dental fluorosis into a major disorder, yet callously disregard the lifetimes of extreme pain, debilitation, black discoloration and loss of teeth, development of serious medical conditions, and life-threatening infection, directly resultant of untreated dental decay which can be, and is, prevented by water fluoridation. The real question is…….how do you justify condemning people to this because you are “concerned” about such a non-issue as mild dental fluorosis? In 33 years of practicing dentistry in a fluoridated community surrounded by fluoridated communities, I have as yet to see one single case of dental fluorosis attributable to dental fluorosis which could even be detected outside of close examination in my dental chair. 2. Beause you refuse to take the time and exert the minimal amount of effort to obtain studies, does not mean that they are not available. Decision makers have as much access to the actual studies as do I, or anyone else. The problem with antifluoridationists is that they are too lazy to seek out, read, and attempt to properly understand these studies, instead being content to be spoon-fed the misrepresented results, and out-of-context quotes plucked from these studies, located on little antifluoridationist websites and blogs. An increasing number of antifluoridationists are now citing Connett’s “Second Look” site which is full of titles of studies, I suppose expecting readers to simply accept their nonsense because there are countless studies in the literature which have the word “fluoride” in them somewhere. 3. Even if one accepts the antifluoridation skewing of Brunnelle and Carlos data, 0.6 of a tooth surface equals 1 tooth surface. Decay doesn’t stop at some boundary line located on a tooth surface. Untreated dental decay in but one tooth surface can, and does cause the lifetimes of effects I noted in #1. People have died as a direct result of untreated dental decay in but one surface of one tooth. 4. The “delayed eruption” theory has no merit. ——-J Public Health Dent. 2014 Aug;74(3):241-7. doi: 10.1111/jphd.12053. Epub 2014 Mar 17. Does fluoride in drinking water delay tooth eruption? Jolaoso IA1, Kumar J, Moss ME. ——Leroy R, et al. (2003). The effect of fluorides and caries in primary teeth on permanent tooth emergence. Community Dentistry and Oral Epidemiology 31(6):463-70. —–National Fluoridation Information Service (2011): Does Delayed Tooth Eruption Negate The Effect of Water Fluoridation? National Fluoridation Information Service Advisory June 2011, Wellington, New Zealand. 3. “When you take into account that more than 97% of the studies used by Cochrane 2015 were a high risk of bias” …..” is an inaccurate assessment. Because Cochrane decided that these studies met its definition of “high risk of bias” does mean that they were at high risk to be so, or that they were biases. It simply means that the Cochrane reviewers deemed them to be. Science is based upon consensus opinion. What one particular study may conclude, does not mean that this conclusion has been “proven”, or that it is even accurate. It simply means that this conclusion has been reached by the authors of that particular study, a conclusion which should be included in consideration of the overall body of valid scientific evidence on that issue. Antifluoridationists are notorious for plucking infomation from the literature, quoting it out-of-context, and putting it forth as “proof” of their claim. Blossom, read my article above. 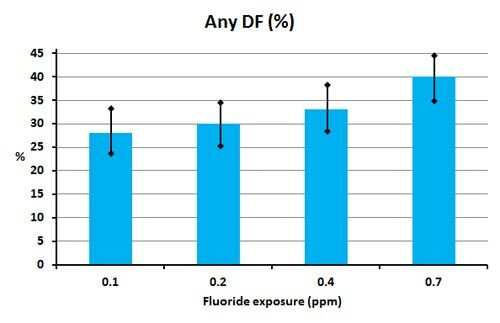 40% occurence of dental fluorosis is not evidence of chronic toxicity as that sort of level, or close to it, is what we see with unfluoridated situations. The increase attributed to adjusting the natural levels of fluoride is very small, often negligible, and occurs in the mildest forms which are usually judged positively for their effect in quality of life. Use of the 40% figure in the way you do is just dishonest scaremongering. And that is reprehensible. Ken – a point of clarification please. Is there a difference between adjusting the natural levels of fluoride and adjusting the levels of natural fluoride and what do you mean by levels? Also what is the difference between dose and concentration? Giving you some leeway here as people use the term “fluoride” quite inappropriately at times. I find that people who answer a question with a question are generally obfuscationists. The context of my question is in your response to blossom and the question was, I thought, unambiguous and simple. You are right that my understanding of chemistry is limited hence my questions to someone who claims to know it all. In my understanding, and in this context of “fluoride” in drinking water I understand the word to mean the hydrated fluoride anion. There is no difference between theses anions whatever the source – “natural” are added during treatment. Now, perhaps you could either take issue with that ( and in the process take on the understanding of all chemists) or you could clarify the meaning of your terms in your question. 1) “natural levels” are those occurring in a source not interfered with by humans. That is, the adjective “natural” relates to the term “level”. Therefore, as soon as they are adjusted by human intervention the resulting level is no longer natural. 2) “natural fluoride” – here the adjective “natural” relates to the term “fluoride”. As such, it is essentially a loaded and nonsense term. The phrase is useful only if you presume the adjective relates to the source of the fluoride rather than the substance itself, as fluoride is always fluoride, regardless of source. Therefore any adjustment of fluoride levels is an adjustment of “natural” fluoride. If you take issue with this, you are welcome to explain the physical and chemical differences between the “natural” and “unnatural” fluoride ions. Whatever impurities are in any fluoridating agent end up in public drinking water supplies regardless of any disassociation of individual ingredients. Naturally-occurring fluoride is calcium fluoride (CaF). The three fluoridating agents permitted for use in water supply are euphemistically called “fluoride” but are different products: i.e. sodium fluoride (NaF); hydrofluorosilicic acid (H2SiF6) and sodium fluorosilicate (Na2SiF6). The latter two are collected in pollution scrubbers (generally of the phosphate fertilizer industry) to prevent their escape into the environment where they could damage the soil, crops, stock, humans, flora and fauna. The unrefined product H2SiF6 is so corrosive that it is generally delivered in rubber-lined tankers. This raw product can eat through concrete. Na2SiF6 is a dry product as generally is NaF. “Fluorodose” is NaF which is distributed for use in small packages where it is used in small communities that only cater for a small number of people. Package and all are dissolved in the drinking water and the unfortunate people unwittingly drink the dissolved packages as well. Even natural fluoride (CaF) can be harmful at very low levels for people who are poorly nourished. Ken, you can show that you are open to unbiased debate by allowing this to be published. Looks like Trev is another satisfied customer – he appears to be happy with the advice he received here on chemistry and grammar. 1: The most sensible interpretation of Trev’s question is that he was asking about “fluoride” in solution, in drinking water. After all one can talk about the “level” or “concentration” in solution – but not about the “level” of a solid. 2: “Naturally” occurring “fluoride” occurs in the solid state as several different minerals, one being calcium fluoride (CaF2 not CaF). Another being apatites – similar to teeth and bones which “naturally” contain fluoride. 3: The use of the term “natural” is very misleading if it is meant to imply something good. “Natural,” raw caF2 ore would not be acceptable as a fluoridating agent – if only because of the impurities it “naturally” contains. The levels of impurities for water treatment are controlled by regulations. A suitable form of CaF2 would only be produced after dissolution in acid and precipitation of CaF2 from the HF produced. I guess one would not call this manufactured material “natural” – but it is far safer than the original material. You can see why terms like “natural” and “artificial” are very misleading. 4: CaF2 just does not exist in solution – in drinking water. The solid must break up to dissolve and the constituent anions and cation exist independently. The “fluoride” in drinking water exists as the hydrated fluoride anion – whatever its starting material, CaF2, NaF, fluosilicates or fluorosilicic acid (the later 2 decompose on dilution to form silica and the hydrated fluoride anion – fluorosilicates cannot exist in water at low concentrations). 5: Concentrated chemicals are often corrosive and toxic – nothing new there. that is why there are material data sheets advising those who handle, transport, dispose of or manufacture concentrated chemicals of the regulations involved. Such material data sheets are irrelevant ot drinking water – and only an ignorant person, or someone wishing to misinform or scaremonger, would use them in a discussion of community water fluoridation. Blossom – it is easy to present misleading claims on impurities in fluoridating chemicals if your intention is to scaremonger. However, the level of impurities is regulated and this graph shows how the measured levels (taken from 16 Australian certificates of analysis for fluorosilicic acid) compare with the regulated maxima. You also need to put such impurities into context with those present ion the “natural” water sources used. T^his graph compares the “natural” levels of arsenic in the water source used for my city to that contributed by fluoridating chemicals. And how does your smart-arse remark about comprehension and grammar contribute to the debate? I commented on comprehension and grammar. which is indicative of confusion (non-comprehension) of the terms natural levels of fluoride and levels of natural fluoride. The confusion disappears when the grammar is understood. Researchers, including New Zealand scientist Dr Linda Gulliver, have released findings into possible links between common chemicals and the development of cancer. Their results, published in the journal Carcinogenesis, show mixtures of chemicals used in our environment may be acting in concert with each other inside the body to trigger the disease. Gulliver, from Otago University’s faculty of medicine, says on the back of the findings of the Halifax Project, “considerable attention” needs to be given to investigating the concerning links. A high-profile taskforce was formed in 2013 by the international organisation Getting to Know Cancer, which was concerned that cancer research was focused primarily on the role of heritable and lifestyle factors as triggers. This is despite evidence that as many as one in five cancers may be caused by chemical exposures in the environment that are not related to personal lifestyle choices. Chemicals are tested for carcinogenic links, but only one at a time, leaving questions around the possibility that a fusion of these chemicals may instead be causing cancer. The taskforce of 174 scientists in 28 countries investigated 85 prototypic chemicals that were not considered to be carcinogenic to humans, and they reviewed their effects against a long list of mechanisms that are important for cancer development. Working in teams that focused on various hallmarks of cancer, the group found that 50 of those chemicals examined supported key cancer-related mechanisms at levels at which humans are routinely exposed. The finding supports the idea that chemicals may be capable of acting in concert with one another to cause cancer, even though low-level exposures to these chemicals individually might not be carcinogenic. Lead researcher William Goodson III, from San Francisco’s California Pacific Medical Center, said his results show one-at-a-time testing is out of date and must be modernised. Facinating Trevor. Chemicals in the environment can cause cancer. What a startling discovery. Of no relevance to optimally fluoridated water, however. Unlike you Steve I look at medical science not the biased studies you dogmatically proclaim as proof the CWF is safe, beneficial and cost effective. You may be a dentist but you are also a zealot! Excuse my French, but Trev looking “at medical science not the biased studies” my arse. Trev wouldn’t recognise a medial study if he tripped over it. He has simply used copypasta of a newspaper article – unattributed as usual. And attempted to draw unwarranted conclusions. It is scatty attempts at scaremongering like this that explain why his silly attempt to use the High Court to prevent Hamilton reintroducing fluroidation was bound to fail. Even that was obvious to him after an initial blast of publicity – so obvious he retreated. He has simply used copypasta of a newspaper article – unattributed as usual. The clown called Trevor is incapable of learning. For what it is worth, here is the article. What a comfort….knowing that Trevor is on top of all the latest medical science, keeping us fully informed at all times……. I’m afraid you made the common error of confusing incidence with prevalence and the common error of confusing a percentage point increase for a percentage increase. The graph you derived the numbers from uses prevalence data, not incidence data. Prevalence includes all cases, incidence includes only new cases in a time period of interest. In this case, 7 and 10 are percentage point increases. But the 7 percentage point increase is actually an increase from 33% to 40%. Divide 7 by 33 and you find that 40 represents a 21% increase in prevalence. Again 2 and 3 are percentage point increases on the graph. The correct percentage increases (in prevalence) are 33% and 20% respectively. I agree I often use the words incidence and prevalence as commonly indicating the same thing, but I will go through and change to prevalence as this is the term usually used for actual measurements (and is used in the Cochrane review). To be absolutely correct, though, the data presented is for probability – a calculated estimate rather than measured prevalence. However, I felt that, while correct, would introduce an unwarranted level of confusion. As for use of percentages. These can always be confusing and, as you say, I am using changes in percentage points rather than calculating a new percentage which would certainly be confusing and certainly not what I intended. It would also be meaningless for this particular discussion. I felt this was obvious from the context – but again I will have a look to see if it needs clarification. Ken, you made a calculation by subtraction. For what you described, the proper calculation involves division. Percentage increase makes a comparison in relative terms (which is of etiologic significance when using incidence data). Percentage point increase makes a comparison in absolute terms (and measures impact when using incidence data). See https://xkcd.com/985/ for the importance of being clear. Yes, William, your point has already been taken and I was well aware of the confusion created by using percentages (the presentation in the Cochrane review as a prevalence due to fluoridation, and the way this is peddled by motivated activists, certainly underlines the rampant confusion possible). As I said I believe the context makes this clear (especially as the probabilities are presented graphically) – and, as I said, I will have another look and see if more clarification is required (as you, at least, seem to have taken the wrong message). Any comments on the actual post itself, though? Again the above re-iterates the oft repeated call in study after study of the need for valid research into fluoridation. The mantra adopted in the 1960s that fluoridation is ‘safe, beneficial and cost effective’ no longer has the bite it once had. The weight of evidence is shifting and once a tipping point is reached the pro fluoride lobby will be history. The sooner the better! Why don’t you actually have a read of the Cochrane report? You might then find out that this Newsweek article is also pathetic. And then claim the review found no statistically significant reduction in decay of permanent teeth. And falsely attribute that claim to one of the authors! I know what has happened to my health since I stopped ingesting fluoridated tap water and if that has made me ignorant of the safety and benefits of the practice then I admit to being ignorant but happily so. I don’t understand why you and your small cabal of zealots want NZ to join with the statistically insignificant number of nations who still add a by-product of fert manufacturing to their people’s water regardless of any disbenefit or damage to the individuals concerned. So, Trev, the “medical studies” you claim to rely on turn out to be personal hypochondria!